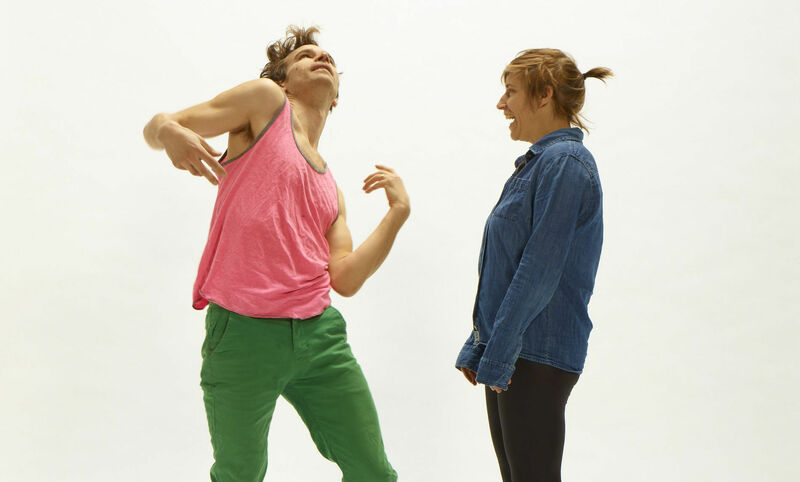 BodyCartography Project (BCP), a Minneapolis-based dance collective of Olive Bieringa and Otto Ramstad, celebrate their twentieth anniversary with a tour that concludes at the Weisman Art Museum (WAM) in Minneapolis in the summer of 2018. It began in the Performance Arcade festival in Wellington (New Zealand), and continued in SFMOMA (San Francisco). 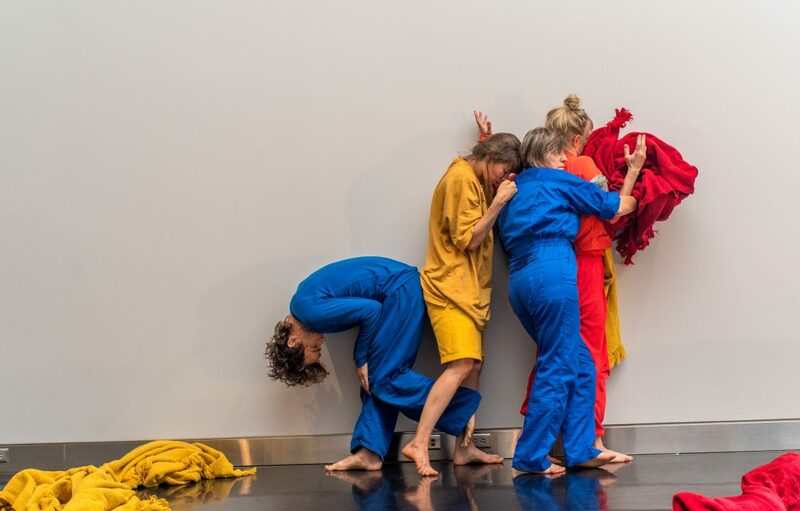 During this tour, Te Papa, the national museum of New Zealand, acquired BCP’s piece Walk with me as their first ever intangible dance acquisition—an extremely rare achievement in the object-centric world of art museums. At WAM, BCP presents four pieces: action movie, the one-on-one, personalized collaboration between a dancer and a viewer; felt room, a three-hour long spacetime environment built of light, darkness, movement, and soundscapes; the place of space, a collaboration between dancers and UMN medical students on understanding embryonic development; and lineage, an embodied narrative of a dancer’s ancestry. Traditional performances are mostly structured situations—performers tell a story to viewers, who in turn agree to embrace it as real and suspend their reality. BCP’s performances are different: creators ask the viewers to embrace their own reality instead of suspending it. 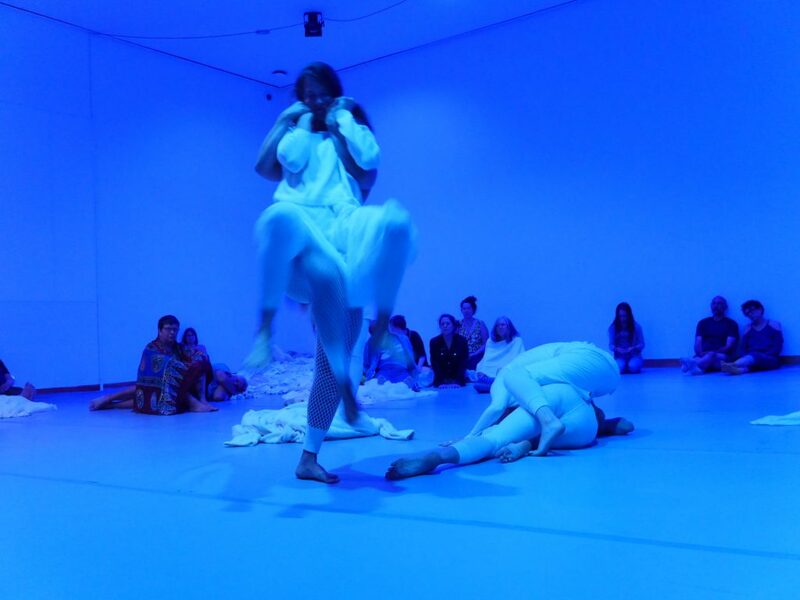 Each piece has a unique story, an entry point from which the performance will evolve—and viewers are responsible for this evolution as much as the dancers. I experienced the piece action movie in San Francisco Museum of Modern Art. The casually-dressed dancer approached me and explained the protocol: I will be led by the hand, and I will be told when to close and open my eyes. At first, the communication is just that: “open,” “close.” “Close!” I complied and shut my eyes: he walked me slowly through the hallway. The sounds gradually amplified, “Open!”: I saw him improvising on the coat check counter. “Close!” walk, “Open!”: I saw the San Francisco downtown cityscape through the window. “Close!” sound of automatic doors, walk, cold air, street hum; “Open!” the dancer improvised on the outdoor terrace… and then finally it struck me: I am allowed to turn my head. No one forbade me to, and so I am free to move my gaze away from the dancer and look around. And only then, when I did so, the real communication began to be established: the dancer followed my gaze, drew attention, signaled back. “Open,” “Close”—this was a communication protocol devoid of content; the real relationship between us only happened when I exercised my freedom by taking that seemingly trivial and remarkably non-obvious decision. Sarah Baumert performs “action movie” at WAM. The text that follows traces the development of BCP’s practice of dance as relationship building. It began as my interview with Olive. Subsequently, Olive, Otto and I edited it. We were always drawn to dance because we want to work in conversation. It is all about working with the essence of an environment, with the materialities of places and of bodies. We’re here, now, in this moment, and let’s be present with this place, each other, and ourselves, and we’re going to make a dance with this tree, and this tree is going to do what this tree is going to do, and . . . we have this thing. We have a conversation. This is the way we approach dance. Our work is rooted in experimental dance and somatic practices of 1960s and ’70s. Somatic practice is an approach to movement, body, and consciousness that asks: What is the lived experience of the body? In many ways this is a conversation between experiential and empirical knowledge, between Western ideas of physiology and Eastern ideas of the body, spirit, and energy. How do we experience our body as a living thing? How can we draw on different kinds of knowledge to help us make sense of the complexity of who we are? We work specifically with Body-Mind Centering©, a practice developed by Bonnie Bainbridge Cohen. In this practice we learn to open up consciousness of tissues in our bodies through touch and movement. We can move from muscles. We can also move from bones. We can move from organs. We can touch any of those things. We can touch our blood. We can feel venous blood flow and how it’s different than arterial flow. We can move from synovial fluid (the fluid that surrounds joints) and feel how that is different from moving from blood. We can work from spinal fluid. We can touch cerebral spinal fluid and feel its rhythm. We can work with the nervous system, the connective tissue, endocrine glands, the DNA and so on. At present we are exploring embryology, the knowledge of how we develop from few cells to conscious beings. Thinking about embryology lets us time-travel in our tissue. We can go back to when we were simple, just fluid spaces and membranes, a cluster of cells, before we had arms and legs. We can go back to when we were just a three-layered disc with a front body, a middle body, and a back body. When our middle body was all this undifferentiated tissue that was going to become muscles, bones, connective tissue, heart, and reproductive organs. At WAM we bring dancers together with medical students and use the language of somatic practice and Body-Mind Centering© as a way to begin. We’re working with touch and movement, we look at anatomy books, and we share knowledge. All the different perspectives that people bring to this subject matter expands our knowledge, which is not just conceptual but is embodied in us, we each carry it in our physical being. This process can help us get a deeper understanding of the body, but also can provide insight into other ways of working with the body to make dance or a visual art or film or music. What we find fascinating is that we have these sources, but we also have gaps between sources where new knowledge can emerge and where we can build something. This is not necessarily about creating some single version of truth but about how to collectively build up knowledge that includes all of our different types of knowledge. How does our understanding of all we went through on a cellular level very early on in our embryonic development impact conversations across disciplines and inform something that we make together as fully formed human beings. Workshop during “the place of space” project at WAM. For example, we can talk about the sperm and the egg. Is it about the sperm penetrating the egg, or is it about the egg deciding which sperm they’re going to let in? How do we step back and say: the sperm had a certain energetic quality; the egg had a certain energetic quality; both energetic qualities inform who we are now? Because we are made up of both of those things. Where is the agency within this miraculous fluid journey that we each went through? I think all of those points of view are fascinating to examine from different perspectives. From a traditional Western perspective, embodied perspectives, different cultural perspectives, perspectives of those who haven’t consciously been exposed to any of this knowledge at all. And finally, we can take those questions of agency into movement. How does it inform us choreographically that we, as embryos, created space in which we existed before we created our structure? What is the significance of this embryonic knowledge, for us and for audience, when we develop it into a choreographed state that we can return to over time? Olive Bieringa, Otto Ramstad, and Emma Barber perform “the place of space” at WAM. What’s foundational to our work is an understanding of the development of our senses and perceptions. When we’re growing inside the womb, our sense of movement and of touch develop first. Kinesthesia, our sense of movement, registers in our sensory systems very early in life. When we’re floating about in the womb, touching ourselves, touching the uterine wall, we are learning about what is us and what is our environment. Gravity helps us figure out how we’re oriented in space. Where’s our head in relationship to our feet? Are we horizontal or vertical? How fast are we moving? We learn about our world through how we touch it, how it touches us and how we move in relationship to it. The next senses to develop are smell and taste, then hearing, and then our seeing comes last. Seeing is registered up in the cortex (the outer layer of the brain), whereas the early senses are processed lower in the brain. This developmental progression of senses defines how we understand the world. When we look at a frozen lake, we understand that it’s frozen not only because we see it but because we’ve experienced its effect on our body before: we’ve felt its temperature, its slipperiness, its taste, we heard it crackle under our feet. All of that past experience helps us interpret what we’re seeing. We understand a frozen lake because we have embodied knowledge of what a frozen lake is. Otto Ramstad performs “action movie.” Photo: Olive Bieringa. All of this embodied knowledge feeds an embodied imagination. How can we create opportunities to cultivate our embodied imagination? One way we can do this is by reducing visual input and depending only on the “earliest” senses. In the piece “action movie” we’re doing a tour that questions our habits of understanding something purely visually. We take a walk, one dancer and one audience member, and the dancer instructs the audience member to open and close their eyes as we walk. We’re guiding them through touch, helping them track sound in space as they walk around with their eyes shut. They touch things, maybe they smell things. Sometimes we feed them. That sensory progression from touch to seeing is very important to this piece in unlocking trust and allowing the audience to feel themselves, feeling their own experience. It is just the two of us, one dancer and one audience partner, a very intimate and very personal experience. When I’m doing something crazy, like rolling on the street, I’m putting the audience member in the illusionary position of being my caretaker. I’m being your caretaker when your eyes are closed, but that moment when your eyes are open, you’re also being implicated in this experience. I’m interested in the ambiguity of that role-shifting: both the dancer and the audience partner constantly have to question how they want to be present and what role do they want to take. As the partner you could start talking to the people around you: no one said that you couldn’t turn around and say, “She’s dancing for me.” But you can also choose to have an experience and be present with what’s being offered to you. And, at the point that you take charge of your experience and start turning your head and look around I, the dancer, have to take on more responsibility because your “frame” all of a sudden got bigger. We watch each other learn. Your process of learning, and my following of your learning, we’re in it together, so we’re constantly having to … to have a developing relationship. So, you see how the conversation about embryology naturally brings on a conversation about space and relationships. It brings us to a practice that is a conversation that is relational to the world. Performance of “Station/Stationary,” 2008. Photo: Cheshire Dance. Understanding how I make my own space, how my body fits or doesn’t fit in this environment, or how my body has a conversation with my environment as a physical and a social being. All of these pieces of who I am and where I come from have an impact on what gets created or what’s possible in a given environment. It is a deeply embodied, visceral, and political practice. When we first started making work, we were very interested in how dance functioned in different spaces. From early on we decided that we didn’t want to spend time renting a place and trying to drag in an audience in from this beautiful weather outside. We thought, what if instead we just start making work in public spaces.Then we can work as much as we want, invite people in and have these very open and inclusive performances. Performance of “Blind Stroll,” 1998. Photo: BodyCartography Project. In the first four-five years BodyCartography functioned as an open laboratory and not a company. We experimented with different improvisational practices – and I’m not talking just any improvisation. We did rigorous improvisational practice coming out of the work of Lisa Nelson, Contact Improvisation, Steve Paxton, and then eventually Bonnie Bainbridge Cohen’s work with Body-Mind Centering©. This was pre-flash mob. Sometimes we would go and do a slow-motion walk for an hour dressed in a particular color through a particular street or a particular neighborhood. Sometimes we would work somewhere for a day or a week and build a big dance spectacle. Who we’re working with? Where we are working? What are the behavioral norms of this specific landscape, and how do we work with those social norms to create a different way of being in this place? One of the things that happened when we started to do public work was learning what was actually, technically, a public space. Half the pavement in many places is owned by the building and half by the city. That means that on half the pavement we can do some things, and on the other half we can do other things. It depends on the building security, but it also depends on whether dancing in public space is legal – which hasn’t been in many US cities for a long time. Olive Bieringa performs “Go,” 2005. Photo: Christian Glauss. But what constitutes a dance? Is lying down on the pavement legal? Is sitting legal? Can we get away with it? Can someone else get away with it? What if our performers are artists of color? What if the security guard here is cool with what we are doing but the security guard in the next building is not? When you work in relation to places, the questions escalate very fast from abstract concepts and theories to practical questions of power, of what is practically possible when you’re working with ambiguous practices. And we are just insistent on having this practice that maybe does, and maybe does not, look like something people will recognize as dance. We’re just interested in people being people, people exploring movement possibilities, people exploring different kinds of possibilities for what’s physically possible as an expression of humanness.